When I set out to find a subject for my 1916 project, I was delighted to come across Kathleen Kingston, a woman from Birr, my local town; who went to school in the Convent in Roscrea, as I did; and who moved to Dublin, again as I did; and who sold women’s clothing in Nassau Street as I do now – I reckoned this was a story I could tell. As an artist who works in textiles, I thought I’d tell this story in the textiles you would have found in Kingston’s shop. I am so lucky to have my exhibition in the County Buildings opened by Cathal Brugha, a grandson who carries the very famous family name; and attended by Georgie Kingston, Kathleen’s niece who lived with her, and who is the daughter of Kathleen’s brother Charles, a previous Offaly County Secretary; along with many other family members that I did not know of when starting this project who are coming along to celebrate Kathleen’s life. 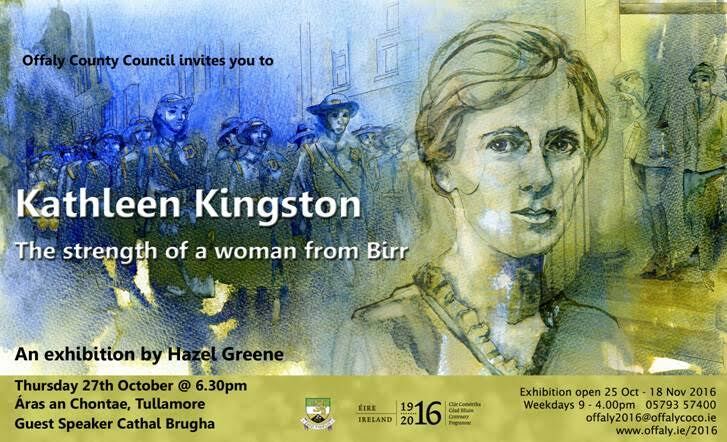 This exhibition tells the story of a woman of strength from Birr. Kathleen was baptised Catherine Mary and born into a prosperous shop keeping and land owning family in Birr, living over the shop that her family ran for almost 100 years on the corner of Main Street and Market Square, beside the Maid of Erin monument which was erected when she was 15. With her sister, who stayed on and joined the order, Kathleen was sent to boarding school in Roscrea with the Sacred Heart nuns, returning to the beautiful Georgian town of Birr, which was at that time a garrison town that held no charm for her. There was a strong celtic movement in Ireland at that time and that appealed to Kathleen more, she joined Irish language classes held in the little church-like building on Green Street run by the Gaelic League. It was here she met Cathal Brugha (born Charles William St John Burgess educated at Belvedere) who travelled around Ireland with his work and in support of Irish culture; Cathal and Caitlin Brugha were married two years later. We don’t know exactly the role of Caitlin during the Rising, as with so many women. We do know her life changed radically as she joined the heart of the republican struggle and Cumann na mBan. We know a lot more about the very active role of her husband and that they went on to be the First Minister of the New State government and our first ever female TD. We can only imagine the lively discussions between husband and wife on the direction of the new state, Cathal being a supporter of Eamon de Valera and Caitlin an abstentionist – never speaking to de Valera after the death of her husband, even though he attended her funeral as President. Widowed in 1922 with six children under the age of 10, Caitlin went on to display strength of a different kind; her husband had died from a gunshot wound and she knew him to be safe at rest, so instead of asking for prayers that he didn’t need, she asked for prayers for the cause. She campaigned and won two Dail elections, never taking up her seat or the TD salary. Caitlin went on to prove herself a very successful business woman, initially opening a women’s wear shop on Nassau Street, travelling to England for dress stock. Deciding the pace of change in women’s fashion to be too fast for a stable business, she changed to men’s wear, and with the backing of her brother, opened shops on Grafton Street, George’s Street and O’Connell Street, priding themselves on the quality of their material and tailoring. You may think that Caitlin’s active Republican support weaned during this period of her life, as I did, until I had the good fortune to meet another of her grandsons, Rossa O Briain (through a girl I went to school with in the Convent in Roscrea!) and Rossa was able to show me recorded interviews with his mother telling stories of her early life – she was definitely Caitlin’s daughter, and there’s a whole other exhibition there! Caitlin died at the age of 80 having led an interesting and unpredictable life.